Do you have a potential sight unseen tenant? I know for many landlords this is scary. How can an applicant possibly want to rent a house without evening looking at it? Well as someone who moves way more than I would ever like to confess (cough, cough, 4 times in 5 years), I have even put an offer on a house purchase as a sight unseen tenant. This is not the time to “technically” tell the truth. Answer all questions truthfully. Heck I even like to go through and answer as many of the question in writing through email or text! Ye,s it has carpet, or yes it has x. I tell the full truth and even the current condition. I always not only tell the tenants about the large elephants in the room so there are no misunderstandings (no garage, not fenced in , tiny back yard), etc –you want to also tell them about the cracked cabinet, the not so “manicured” backyard, etc. Trust me, the tenants, will figureit out! So be up front now! Trust me the last thing you want is stress so honesty saves a lot of stress. Trust me we are all guilty of not having the newest pictures but you don’t want this house to be one of those “match.com” jokes. You know where a 50 year old women puts a picture of her in her 30’s. So show the true condition of your house! In the beginning I did all of the above but yet move-in days were HORRIBLE. The sight unseen tenant was always my best applicant, but nightmares on move-in day. I remember always telling myself, if I survive that first day we would be alright. After two potential disasters and a LOT of stress, I felt that life HAD to get better, starting with day one! I am certainly not a perfect landlord but I tried REALLY hard to be honest and open! Therefore my stress was not over deal breakers. It was over little stuff like a few ants or a little dust. I was at my whits end but I loved these tenants and wanted to pay it forward because, I too, have rented a home sight unseen. So I decided to try something; get it in writing. So my FOURTH cardinal rule was created and now Sight Unseen Clauses s are awesome for the ENTIRE process. I created a “waiver” in my lease. This said I will do the best I can to accommodate the “little things” but beyond that you are on your own. Now, I send the lease and I spend a good amount of time reviewing every line of the lease with the applicant. This waiver is the final piece that makes this process amazing! It set the expectation. ****Disclaimer: As always this is my personal experience. I am nothing more than a landlord who likes to be clear about her expectations and what she looks for in her lease. This is totally NOT legal advice as I am not an attorney so always check local real estate laws and talk to a professional. Here is an example of what I include in my lease. The below is not pertinent as I have viewed the property in person. The below is pertinent as I have not viewed the property in person. In order to accommodate tenants unable to view the property before arriving, we the landlords, allow applicants to apply, be accepted and sign leases without seeing the premise. The pictures were taken and used by the landlord for marketing purposes only! The pictures are supposed to be used to determine whether or not to view a property, not the determinant on whether to rent. Although the landlord offers the pictures and answered all questions in good faith they acknowledge that pictures can be deceiving. Therefore the landlord recommends and encourages the tenant to view the property before signing the lease. If the sight unseen tenant proceeds to sign a lease, then the tenant acknowledges, understands and accepts the risks of signing a lease sight unseen. They understand that the lease is binding and they are held to the lease under the fullest extent of the lease and thereby the law. The tenant is under no circumstance allowed to use “sight unseen” as a reason to void the lease and their obligations to the landlord. If at ANY POINT after the signing of the lease the tenant decides they want to terminate the lease then The Buy Out Clause located in this lease comes into effect. I, ___________________________________________, have read and accepted the above. I understand the risks associated with signing a lease sight unseen. I understand that if I arrive and decide that I am no longer interested in this house that I can invoke the buy out clause located in this lease. 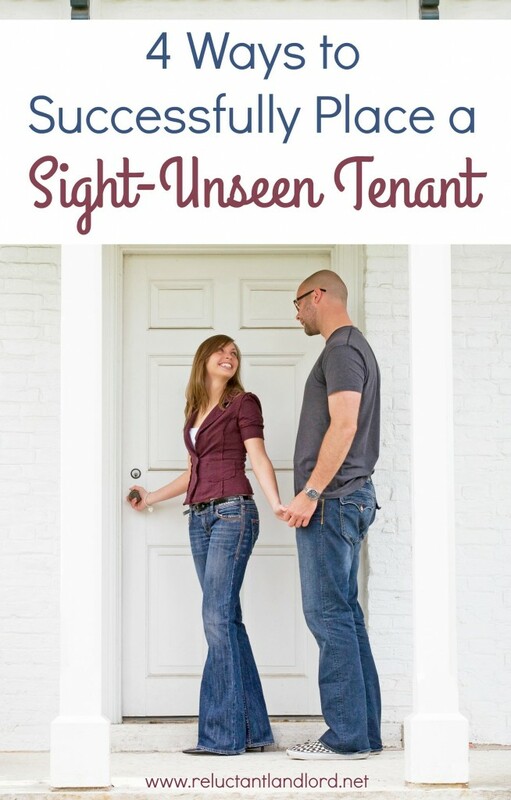 What are your tips to placing a sight unseen tenant? I also included an increased security deposit. It was 1.5 the security deposit and the addition half was applied to first months rent when possession was taken. For me, it have me more than enough to need a month or two to find new tenants, if they refused to take possession for whatever reason. While I would have legal recourse, based on the lease, that takes time and I would have a mortgage and marketing fees to pay in the meantime! My first tenants did this and were great! Great point Christina! Just make sure you check you local real estate laws. Many states have a “cap” on how much security deposit one can charge.